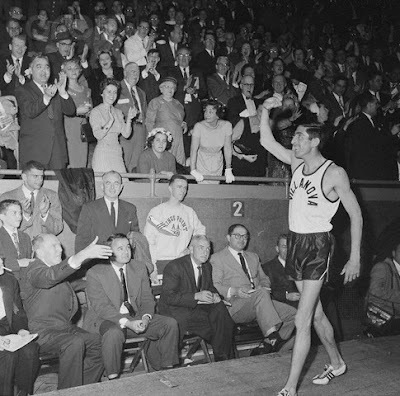 June 1, 1956 -- Villanova sophomore Ron Delany ran 3:59.0 at the Compton Invitational in California to become the first Irishman to break four minutes for the mile. Delany, using his “awkward rock-and-roll kick” (as Cordner Nelson wrote in Track and Field News at the time), came from behind in the stretch to edge by Gunnar Nielsen of Denmark (3:59.1), the World Indoor record holder at the time. 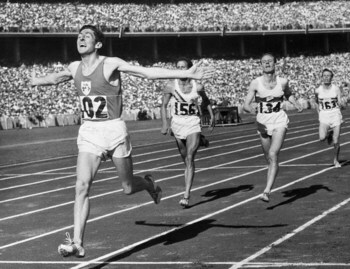 Delany, who went on to the gold medal in the 1500-meters at the 1956 Olympics in Melbourne, would break Nielsen’s world mark two years later. Finishing 3rd was former Villanova star Fred Dwyer, whose time of 4:00.8 missed Wes Santee’s American Record by .3s. Delany’s effort came at a high price, as explained by Ian O’Riordan in his A History of Ireland’s Greatest Milers: "If the physical cost in Delany's effort appears minimal, there was a financial one. He'd arrived in Compton needing a new pair of running spikes and figured he could soften the local shoe salesman into loaning him a pair. But the man wanted $13 and the best Delany could do was to agree on $10. 'I'd also been told that these adidas shoes were the only ones to wear. Back then, of course, everything was so strictly amateur that I could never have accepted a pair of shoes. I thought I might get away with borrowing them. Marketing meant nothing back then either and it was absolutely no use to the salesman to say someone had run the four-minute mile in a pair of his shoes. So I had to give him those $10, all the money I had. Once word got back to Ireland that I'd run under four minutes various newspapers were on to me, and, of course, I mentioned the shoes. And they all loved that. Most of the headlines said my four-minute mile had cost me my last $10'." Exactly one year later, on June 1, 1957 Delany, then a junior, won IC4A titles at NY’s Randall’s Island in the 880y (1:49.5, over Tom Murphy-1:49.8) and mile (4:08.4). At the time, it was the fastest 1-day double in track history. You can read the full history of Irish miling (highlighting such Villanova aces as Eamonn Coghlan, Marcus O'Sullivan, and others, at http://www.athleticsireland.ie/news/irelandsmilers.htm -- click this post's title to be sent to this page.